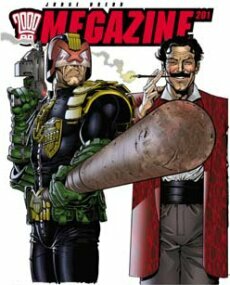 Not only does Meg 201 contain 100 pages of all-out strip action from the world of Judge Dredd and beyond - including a 20-page comedy classic, Phartz!, from Dredd creators John Wagner and Carlos Ezquerra - look out for three new Thrills, and a double helping of David Bishop's highly acclaimed history of 2000 AD! But that's not all ... Megazine 201 comes complete with a 48-page supplement reprinting all of the 1980 vampires-at-war classic Fiends of the Eastern Front, plus a massive double-sided calendar poster featuring Judge Dredd and Durham Red! At the one-off premium price of £5.99, this huge package has got to be the best bargain this side of Betelguese! DEVLIN WAUGH: RED TIDE by John Smith & Colin MacNeil. The camp crusader returns in the ultra-gory sequel to Swimming in Blood. 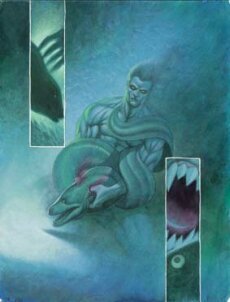 It's been ten years since the outbreak of vampirism which turned the underwater prison of Aquatraz into a charnel-house. The vampire threat has been made safe - and the creatures are now prey for wealthy tourists. Now, a unique specimen is being transported to the nearby Helsing Institute by Vatican agent Devlin Waugh - but what's so special about the terrifying Lilith? And what do the vampires of Fangland want with her? FAMILY by Rob Williams & Simon Fraser. Think you know all about gangsters, wiseguy? You ain't never met gangsters like The Family ... Odysseus City, a few years into the future. The Family are a select cadre bonded by blood, whose powers extend way beyond the usual - and the Family control Odysseus, from penthouse to pavement. OCPD cop Kurt is about to discover that whatever you wanna do, you don't wanna mess with the Family! THE KLEGGS! by Ian Edginton & Mike Collins. Mercenary aliens the Kleggs take payment in the only currency they trust ... meat!Noted for their viciousness and cruelty, the Kleggs' ambitions have always been thwarted by their lack of intelligence - until the emergence of a new generation led by Grand Warmaster Grusk. Kleggs with cunning? Let the universe tremble!